I don't remember how I stumbled across Harold Pinter. It must have been in the mid-60s sometime, but I don't know if it was a live performance of a couple one acts or that terrifying Dirk Bogarde movie The Servant. It might have been Anne Bancroft and Peter Finch duking it out in The Pumpkin Eater. All I know is his plays grabbed me by the throat instantly. I already was a fan of Samuel Beckett, and had staged Waiting For Godot as a student in 1960. Pinter was trickier. For a production of The Homecoming in 1974, my colleagues and I felt we had to build a 2 story house in the theater. Getting the pauses right required actors literally to count off seconds to themselves. One of the eeriest moments of my life occurred in the late 60s as I walked along Fifth Avenue, and Pinter and his wife at the time, Vivien Merchant, came towards me, each on either edge of the sidewalk, obviously in the midst of an argument and issuing forth icy silence. In the instant they passed on each side I was living a Pinter play. O why hide it, my whole life has been a Pinter play. Isn't everybody's? Nobel laureate Harold Pinter: The silences demarcate the warring lines on the battlefield of words. Every playwright of stature has a single most famous line, and Harold Pinter's is undoubtedly (Pause.). The key moments of Pinter's drama, notated as carefully as key changes in chamber music, are those precious seconds of silence in which something important is intentionally left unsaid. The surrounding text may vary from the reddest fury to the tenderest expressions of love or the wooziest flights of surreal fancy, but sooner or later, the Pinter silence, marked off from the dialogue by that tiny italicized word, is sure to fall. As if confirming the inherent truth of his art, Pinter himself was afflicted with a momentary silence last week, on learning that he had been chosen as the recipient of this year's Nobel Prize for Literature. There's something gloriously human—and authentically Pinteresque—in the idea that a master of language could tell the chairman of the Nobel committee, "I don't know what to say." Words are the dialectical battleground of Pinter's works, sometimes treasured and hoarded like irreplaceable gems, sometimes scattered heedlessly like junk in a looted dime store. His people live by them, betray them, bicker over them, flay one another with them. A Pinter woman says "casserole" when she means "wife." A Pinter man, asked if he went "the whole hog," replies that you can sometimes be satisfied "without going any hog." At times, the words are the action; at others, they exist in a schizophrenic counterpoint to it, placid where the physical life is violent or fast and furious while the bodies onstage remain in utter stasis. The silences demarcate the map of this double battlefield, temporary truces in both the war over words and the war between words and actions. These perennial clashes are the essence of Pinter's artistic identity, coming from a personal identity which is itself a sort of permanent conflict: English and Jewish, he is an actor who became a poet who became a playwright and screenwriter who became a stage director who became a prominent political figure; with the arguable exception of poetry, he has done outstanding work in all these fields. To examine his work in any of them is to discover more instances of his dualism. While his plays are celebrated for their terse, brutal contemporaneity, his best-known screenplays are steeped in a haunted, pre-modern past (The Servant, The Go-Between, The French Lieutenant's Woman). As a director he has delved in the works of both predecessors and disciples: Who else could have produced notable stagings of such antithetical works as Noel Coward's Hay Fever and David Mamet's Oleanna? In this respect, Pinter's actor training and actor's instinct are the core of his philosophic vision. The ability to imagine oneself as someone else, which is the essence of all acting, becomes in his hands the terrifying possibility that all human beings possess, of becoming something that is within them but that they never perceive as part of themselves. The past 75 years, which have witnessed inconceiveable cruelties while at the same time making previously unimaginable progress in human healing and comfort, are perfectly expressed in Pinter's contradictory, obstinately convincing works, the products of an artist who, himself a paradoxical figure, has become a guide and a primary influence in his art without ever giving lip service to any shibboleths, dogmas, or ideals of the kind that have so often been proven false by the bitter experiences of his—of our—time. Historian Bob Whealey was kind enough to point out this statement issued by Pinter the day after he won the Nobel Prize. "The great poet Wilfred Owen articulated the tragedy, the horror - and indeed the pity - of war in a way no other poet has. Yet we have learnt nothing. Nearly 100 years after his death the world has become more savage, more brutal, more pitiless. "But the 'free world' we are told, as embodied in the United States and Great Britain, is different to the rest of the world since our actions are dictated and sanctioned by a moral authority and a moral passion condoned by someone called God. Some people may find this difficult to comprehend but Osama Bin Laden finds it easy. "What would Wilfred Owen make of the invasion of Iraq? A bandit act, an act of blatant state terrorism, demonstrating absolute contempt for the concept of International Law. An arbitrary military action inspired by a series of lies upon lies and gross manipulation of the media and therefore of the public. An act intended to consolidate American military and economic control of the Middle East masquerading - as a last resort (all other justifications having failed to justify themselves) - as liberation. A formidable assertion of military force responsible for the death and mutilation of thousands upon thousands of innocent people. "An independent and totally objective account of the Iraqi civilian dead in the medical magazine The Lancet estimates that the figure approaches 100,000. But neither the US or the UK bother to count the Iraqi dead. As General Tommy Franks of US Central Command memorably said: 'We don't do body counts'. "We have brought torture, cluster bombs, depleted uranium, innumerable acts of random murder, misery and degradation to the Iraqi people and call it 'bringing freedom and democracy to the Middle East'. But, as we all know, we have not been welcomed with the predicted flowers. What we have unleashed is a ferocious and unremitting resistance, mayhem and chaos. "You may say at this point: what about the Iraqi elections? Well, President Bush himself answered this question when he said: 'We cannot accept that there can be free democratic elections in a country under foreign military occupation'. I had to read that statement twice before I realised that he was talking about Lebanon and Syria. "What do Bush and Blair actually see when they look at themselves in the mirror? "I believe Wilfred Owen would share our contempt, our revulsion, our nausea and our shame at both the language and the actions of the American and British governments." Pinter was an early influence - a tempter into the theatre of the absurd and an easy leap into the post-modern McCluhanesque grasp of filling in spaces, of actively participating in theatre while in the audience. His minimalistic sets, his bare bones situations and dialogue all demanded cerebral cooperation. Glad he won the prize. I rather disagree with the kind of coverage the mainstream media has been giving Harold Pinter's acceptance speech of the Nobel Prize on Wednesday...such as the coverage was of course. Unable physically to make the trip to Stockholm, Pinter videotaped his message---which is almost an hour long---from his wheelchair. Naturally the press picked up his Bush/Blair blasts, and did not attend to the bulk of his remarks which were about playwriting. If you've been in on Pinter from the beginning, and remember how mysterious he used to be about what he was up to, his openness here is a relief to a Pinter pause that lasted 40 years. Of course a mystery in his work remains...as it should. As it does. It's been nearly 2 years to the day since Harold Pinter was awarded the Nobel Prize that prompted this entry. At the time he was very ill, had suffered a fall---and a gash to the head---and delivered his taped acceptance speech alone in a room, seated in a chair, a blanket covering his legs. He looked like a Samuel Beckett character. I prepared to read an obituary. Toward the end of the new film version of “Sleuth,” a cellphone suddenly rings. The sound is as jarring as gunfire, and it deepens the tension in a scene between Milo (Jude Law), an out-of-work-actor who is not as dumb as he looks, and Andrew (Michael Caine), a famous thriller writer with a cruel streak. The caller is Milo’s lover, Maggie, who also happens to be Andrew’s wife. “I love you too,” Milo coos into the phone, looking at Andrew. But what did Maggie say on the other end? The director, Kenneth Branagh, asked that of the screenwriter, Harold Pinter, in rehearsal, and it was a natural question; in “Sleuth” reality is elusive, and the truth is often little more than an opportunistic weapon. The response was not particularly satisfying, but it was classically Pinteresque. The opacity is deliberate: Mr. Pinter, the author of bleak, often brutal plays like “The Homecoming,” “Betrayal” and “The Caretaker,” is not prepared to elaborate. Mr. Pinter writes in a handsome study on the second floor of a two-story brownstone in west London, just behind the house he shares with his wife, the writer Lady Antonia Fraser. Tucked in a corner of the downstairs office is a table covered with awards he has amassed in his career as a playwright, director, actor, political provocateur, poet and screenwriter, including the French Légion d’Honneur, the Franz Kafka Award and the 2005 Nobel Prize in Literature. A huge portrait of a younger, vigorous Mr. Pinter playing cricket, one of his great passions, dominates a wall upstairs. The painted Mr. Pinter, poised to swing his bat, has a wicked glint in his eye; testosterone all but flies off the canvas. 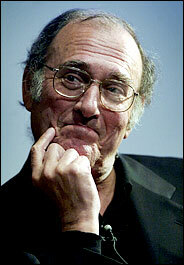 The real Mr. Pinter, who turns 77 this month, is frailer now. In the last five years, he has beaten back both cancer of the esophagus and an autoimmune disorder called pemphigus, and he walks tentatively, using a cane, on legs that have gone weak. But he is as mentally robust, as full of righteous rage, as ever. Mr. Pinter said several years ago that he would not write any more plays, but his work is revived so often that his assertion seems almost beside the point. In the past year “The Hothouse,” “The Dumb Waiter” and “Betrayal” have been presented in London; “The Homecoming” is being performed on Broadway this fall, with a cast led by Ian McShane (“Deadwood”). “Sleuth” — a remake of an earlier film that itself was based on the 1970 play by Anthony Shaffer — is due to be released on Friday. Mr. Pinter had never seen Mr. Shaffer’s “Sleuth,” but when he was approached by Mr. Law (who is also one of the film’s producers), he read the script and was intrigued by the idea at its center: the notion of two men locked in a psychological battle whose proximate cause is a woman. He then set about making the story his own. Shorter than its predecessor, the new “Sleuth” is also less wordy, creepier, darker. While the first film was flamboyant, the new “Sleuth” is full of spare, sometimes cryptic language, significant pauses and another familiar quality of Mr. Pinter’s work: a hint of menace lurking beneath the surface. Much of Mr. Pinter’s work concerns power — who has it, who doesn’t, where it comes from, how it can shift. That is very much the case here. If the personal and the political sometimes merge for Mr. Pinter, the events of the last few years — his illness, his Nobel Prize, the celebrations of his prodigious body of work — have tended to happen in a blur, too. Leaving Dublin two years ago after a retrospective marking his 75th birthday, Mr. Pinter slipped on the pavement at the airport and gashed his head. The next day he learned he had won the Nobel. And then, at home writing his Nobel lecture, he got a call from his doctor. The news was bad; Mr. Pinter needed to go to the hospital immediately. The ambulance was already on its way, but Mr. Pinter managed to finish writing the lecture. He was briefly released from the hospital to deliver it, which he did from a wheelchair on a bare stage at a London television studio, obviously ill, a blanket across his lap, his voice hoarse but steady. The lecture was a blistering indictment of American foreign policy, and it gave Mr. Pinter a world stage for his political views, which over the years have included protests against the NATO bombing of Serbia, censorship, the gulf war and the war in Iraq. Mr. Pinter, who last visited the United States in 2001, for a festival of his work in New York, refuses to go back. But he has prodigious charm to go along his irascibility, and he related an anecdote that hints at somewhat more complicated feelings, or at least proves he can laugh at himself. His latest work, a slim pamphlet called “Six Poems for A.,” comprises poems written over 32 years, with “A” of course being Lady Antonia. The first of the poems was written in Paris, where she and Mr. Pinter traveled soon after they met. More than three decades later the two are rarely apart, and Mr. Pinter turns soft, even cozy, when he talks about his wife. Mr. Pinter has one son from his first marriage, to the actress Vivien Merchant. He and his son have not spoken in 14 years, and his efforts to reach out have been rebuffed, Mr. Pinter said. “There it is,” he said. But he is lucky, he added, to have “inherited” Lady Antonia’s six children, who among them have produced 17 grandchildren. They all call him Grandpa. Mr. Pinter acknowledged that his plays — full of infidelity, cruelty, inhumanity, the lot — seem at odds with his domestic contentment. He often directed plays by others, especially those by Simon Gray (“Butley,” “Otherwise Engaged”), and occasionally his own work. Increasingly and with greater zeal he appeared as an actor — onstage with Paul Eddington in “No Man’s Land” and in films like “Mojo,” “Mansfield Park” and “The Tailor of Panama.” Throughout his life he specialized in playing menacing characters, including several in his own plays (“The Hothouse,” “One for the Road”).